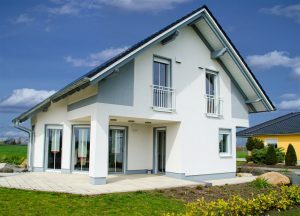 Ireland Insulation - External Insulation Experts - Save Money Now! Our semi-rigid and flexible slabs are high quality resin bonded Rockwool Slabs that can be used for thermal, acoustic and fire insulation. The slabs are manufactured in variety of thicknesses and densities to suit most requirements. The slabs are suitable for many applications including thermal insulation for floors, walls, roofs and boiler rooms. Rockwool stone wool works in two distinct ways to reduce noise. The Rockwool stone wool works by impeding the transmission of sound through the structure. The slabs also absorb sound at the surface. Noise absorption is expressed as a factor between 0 and 1.0. The more sound that a surface absorbs, the higher its absorption coefficient. The insulation panels are manufactured from a closed cell material. This ensures that the panels have excellent thermal insulation properties. The cells in the insulation panels contain air, not gas. This ensures consistent performance during the lifetime of the product. To ensure dimensional stability all panels are produced from blocks that have been aged for a minimum of six weeks. This guarantees quality, efficiency and a decrease in your utility bills. The system can be applied on a variety of existing external surfaces such as brick or rendered masonry walls. The slabs can also be fitted to horizontal or tilted surfaces as long as these surfaces are not directly exposed to precipitation. This may include ceilings over passageways, internal walls and roofs (on the ceiling side) of garages, or even cellars adjacent to heated rooms. If you would like to find out more about external insulation or you are looking for a free quote feel free to contact us using our contact form.